Janelle is an artist, performer, instructor, and has been studying dance since the age of five. She has been studying belly dance since 1995 and just can't get enough. Article about Janelle's Baladi workshop by Renee Rothman, Dance Doc. 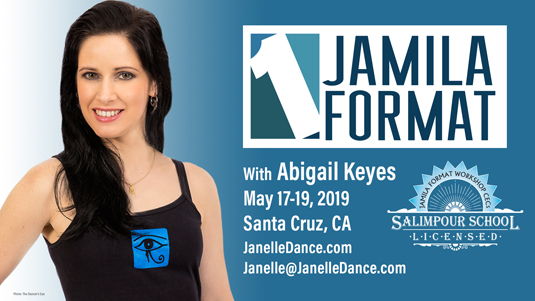 You can find Janelle Belly dance classes at THE NEW Desert Dream Dance Company 1025 Water Street Santa Cruz CA 95062, above Good Omen Tattoo. Check out Janelle and Desert Dream Music & Dance Company for upcoming shows on the EVENTS PAGE. Janelle is currently certified in both Salimpour formats: Suhaila Level 4 and Jamila Level 2. All of Janelle's classes have strong Salimpour influence and use the Suhaila Salimpour nomenclature and Jamila Salimpour steps and vocabulary. Info on the Salimpour formats here. "When this lady does one of her drum solo masterpieces she rocks the world." --Maya Matter, World of Dance Theater Co.